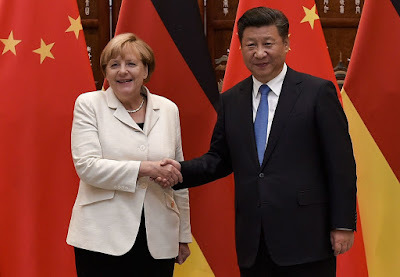 Home / $EUR / $USD / China / Germany / Interest Rates / Merkel: Is She a Xi? Merkel: Is She a Xi? After visiting Russia's Putin earlier this week, German Chancellor Merkel is calling on China's President Xi at the end of the week. Merkel and Xi are savvy politicians, and both have raised a simple practice to a high art form: don't stop adversaries from shooting themselves in the foot. China may be among the largest beneficiaries of recent US policy. The unilateral withdrawal from the Trans-Pacific Partnership undermined the so-called Pivot to Asia. Trump's dislike for the multilateral trading system creates a vacuum that Xi deftly tries to fill despite the obvious contradictions. The weaponization of access to the dollar funding market may have begun with 9-11, but expanded under Obama and is being pushed further by Trump. This encourages workarounds and China could be helpful, including its recently launched yuan-denominated oil futures contract. Merkel is no slouch. She is seeking allies to check the US provocations, including but not limited to the agreement with Iran. US tariffs were ostensibly aimed at China, which Europe could have lived with, but the US wants to subject Europe to the same measures. China removed the term limit for the head of state earlier this year. President Xi holds two other positions that did not have term limits--head of party and head of the military. It was a culmination of actions that concentrated Xi's power. The reforms ushered in by Deng Xiaoping in the late-1970s was at least in part designed to prevent the rise of another Mao. Xi's has unwound these reforms and the balance within the Communist Party between two main factions--the princelings, whose fathers and/or grandfathers were officials, and the Communist Youth League, where unconnected ambitious men can rise and be integrated into the ruling class. For her part, Merkel is also consolidating power. It is not as personal or as nationalistic as Xi, but Merkel is consolidating the power of the creditors in the post-crisis environment. If the monetary union in Europe is going to be completed, the financial system must be put into order first. The recurring problem is that the core countries violate the rules first. This is true for fudging the Maastricht requirements for EMU itself. The door that was wide enough for Germany and France was sufficient for Italy, Spain, and Portugal. Germany and France were the first to violate the budget deficit rules and no penalty was enacted. Numerous European governments, starting with Germany, injected hundreds of billions of euros into their respective national banks. After their banks were fixed, the rules were changed to prevent others from doing the same thing (the Bank Recovery and Resolution Directive, or BRRD was approved in 2014). There were several more things that the post-crisis reforms needed to do to create the conditions that would prevent the taxpayers from the creditor countries from having to bail out foreign banks after they bailed out their own. National idiosyncratic definitions of default, and non-performing loans and their provisioning had to be abandoned in favor of a harmonized definition. The creditors had to prevent other backdoor ways to finagle assistance for banks. This included prohibiting private funded deposit guarantees in Italy, for example, from being used to recap banks. In Italy, the bank-financed deposit insurance was used in the past to restructure banks rather than close them because closing the asset-liability gap was considerably cheaper than fully reimbursing depositors. The creditor countries, led by Germany, climbed a ladder to get their financial house in order in 2009-2013. They effectively removed the ladder after 2013. This serves to reinforce the simmering tensions between the creditors and debtors in Europe. Nevertheless, at the current pace in Italy, before the March elections, it would likely take Italy another decade for its banks to reach a condition under which Germany may be able to contemplate stronger monetary and banking union. However, to secure victory and shape the post-Brexit and post-crisis Europe, more is required of Merkel. Many observers have focused on the ECB. Draghi's term is over next October. With Spain holding the ECB Vice President, and Italy having the presidency now, the way Europe does these things to preserve numerous balances, it would ostensibly be Germany's turn at the helm of the ECB. Bundesbank President Weidmann has not hid his ambition, and many observers recognize him as the front-runner. Still, we had been persuaded that with Draghi's extraordinary policies, many Germans felt it went too far, would be coming to an end, in any event. It was not so important that a German oversaw the unpleasant and unloved task of removing the proverbial punchbowl. Instead, we suggested Merkel could push for a bigger and more significant prize: the presidency of the European Commission. This would put Germany and the creditors in position to lay the foundation for a new era. However, EMU's economic performance is making it difficult for the ECB. After a strong showing in 2017 and especially in the fourth quarter, the entire region slowed in Q1 18. The ECB played up the transitory factors, like weather, a particularly bad flu season, and some labor strife. There has been little improvement, and that was underscored by the flash May PMI released earlier today. It unexpectedly fell to 54.1 (from 55.1) and is the lowest since November 2016. Given some of the forward-looking measures, there is little to hang one's hat on for near-term improvement. There has also been the lack of progress on prices (May's flash core CPI was 0.7%. It bottomed at 0.6% in early 2015). The weaker euro on a trade-weighted basis (~2% since peaking in early March) and sharply higher oil prices suggest that the ECB's staff may tweak its inflation forecasts higher in June, but shave growth estimates. Investors perceive that there is still a broad consensus to finish the asset purchases this year. What seems to be more of an issue is when to adjust the other elements of the unorthodox monetary policy, including the negative deposit rate. The hawkish observers expected the ECB to deliver the first rate hike in March. The less hawkish observers saw the first hike near mid-2019. The doves did not expect a rate hike under Drahgi's watch. The recent string of data is prompting a re-evaluation. The implied yield of the December 2019 Euribor futures contract is falling to new lows for the year, and it has fallen a little more than 25 bp since the end of January. The implied yield is slightly negative (three-five basis points). And this a for a three-month deposit beginning at the end of next year. The bottom line is that the economic performance has raised questions about the ECB's path after the asset purchases are completed. Perhaps, if Merkel, is going to follow Xi's example, she may not want to choose between the EC presidency and the ECB presidency. Merkel may seek both.